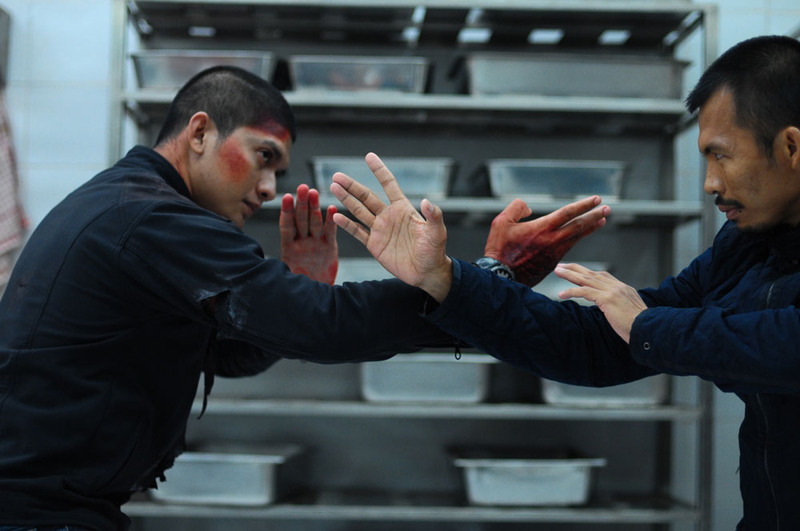 Storyline – Crack Indonesian SWAT team member Rama goes undercover to infiltrate a ruthless jakarta based crime syndicate to expose the corruption in his own police force in order to protect his family. 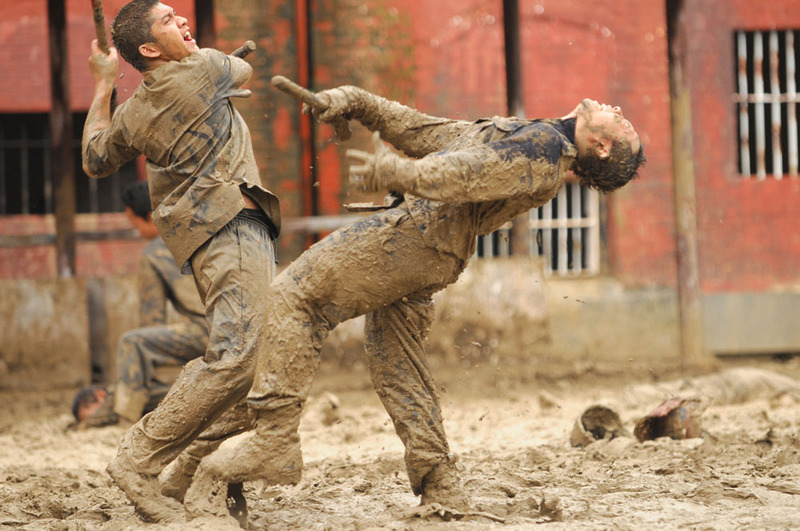 The following photographs are production stills from this high octane action movie. Enjoy . . . 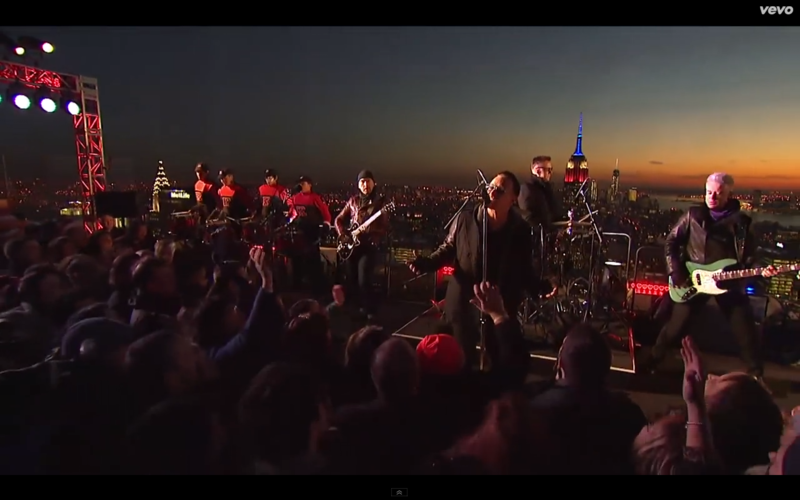 Excellent video production of U2 performing Invisible on The Tonight Show starring Jimmy Kimmel from the roof of 30 Rockefeller Center against a dramatic New York City sunset. Thanks to The Tonight Show, NBC, U2 and Vevo. Posted simply because our lead photographer is Irish and loves things U.S. and U2 (and because the light balance between the NYC cityscape and Bono and the lads is excellent). 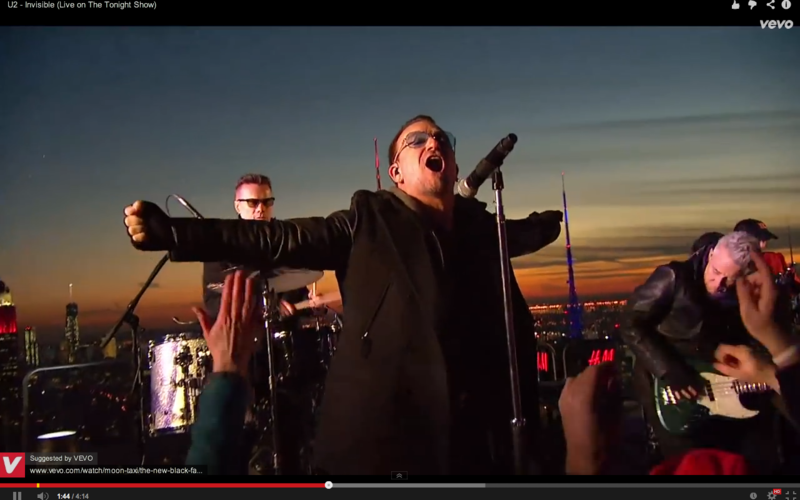 Video screen grab of U2 performing Invisible on The Tonight Show with Jimmy Kimmel from the roof of 30 Rockefeller Center. 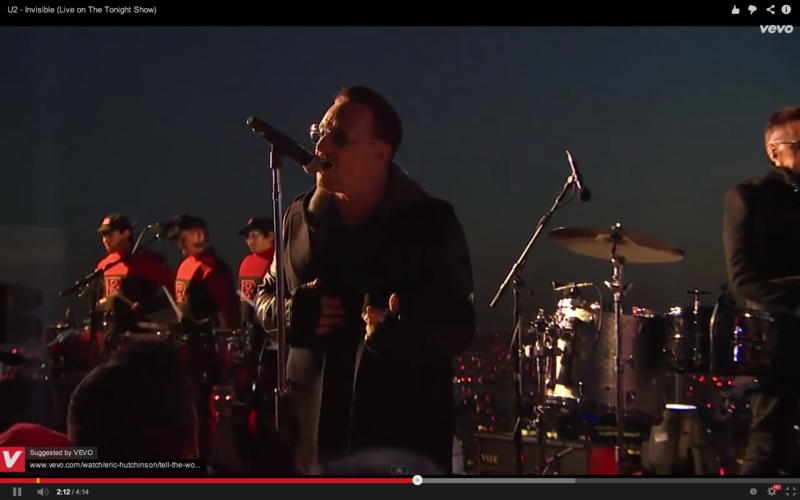 Video screen grab 2 of U2 performing Invisible on The Tonight Show with Jimmy Kimmel from the roof of 30 Rockefeller Center. 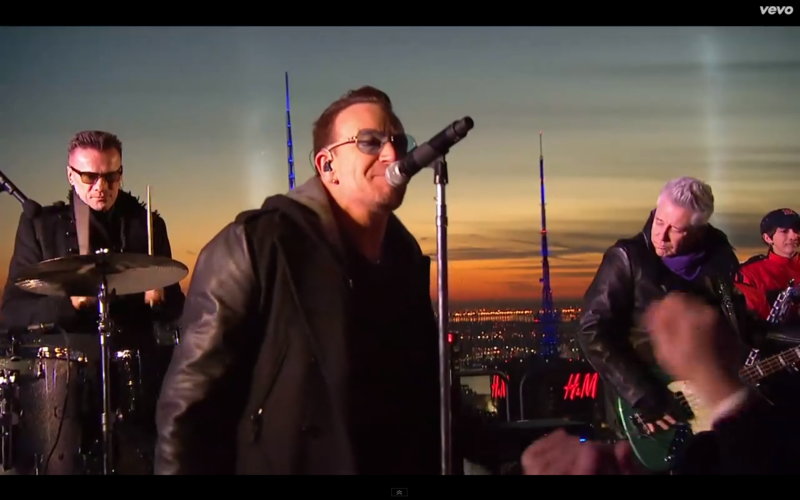 Video screen grab 3 of U2 performing Invisible on The Tonight Show with Jimmy Kimmel from the roof of 30 Rockefeller Center. 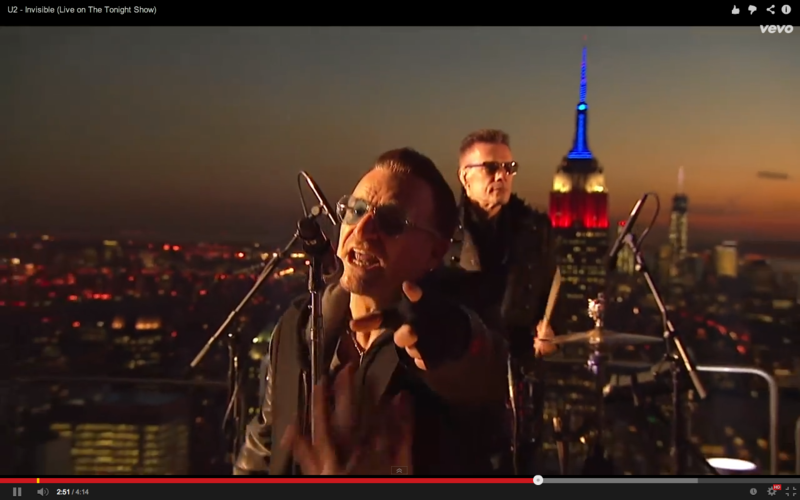 Video screen grab 4 of U2 performing Invisible on The Tonight Show with Jimmy Kimmel from the roof of 30 Rockefeller Center. 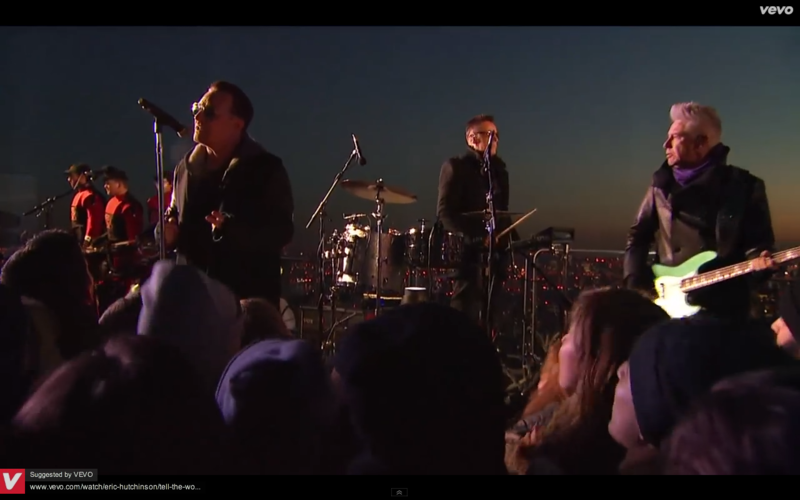 Video screen grab 5 of U2 performing Invisible on The Tonight Show with Jimmy Kimmel from the roof of 30 Rockefeller Center. 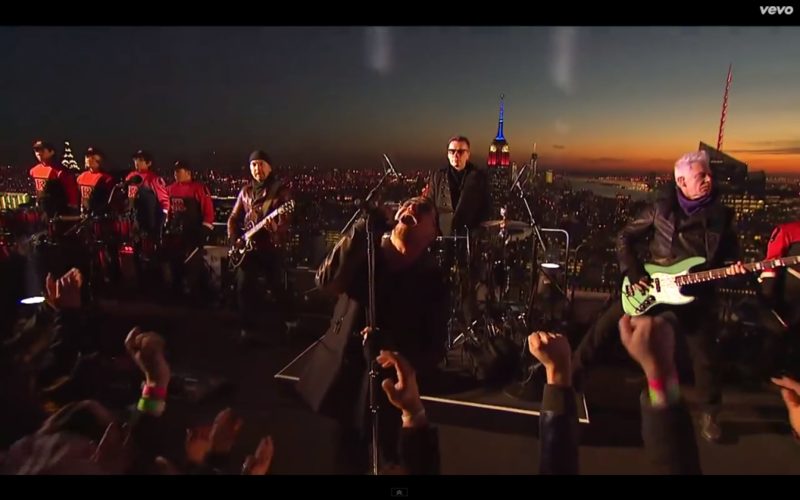 Video screen grab 6 of U2 performing Invisible on The Tonight Show with Jimmy Kimmel from the roof of 30 Rockefeller Center. 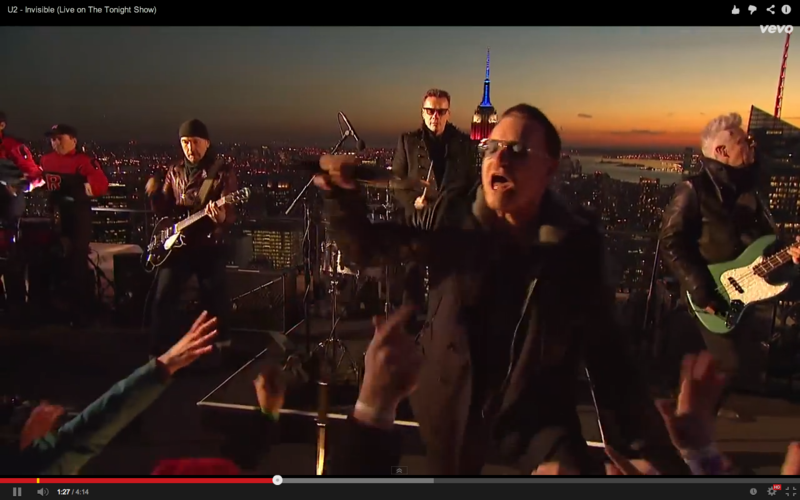 Video screen grab 7 of U2 performing Invisible on The Tonight Show with Jimmy Kimmel from the roof of 30 Rockefeller Center. Video screen grab 8 of U2 performing Invisible on The Tonight Show with Jimmy Kimmel from the roof of 30 Rockefeller Center. 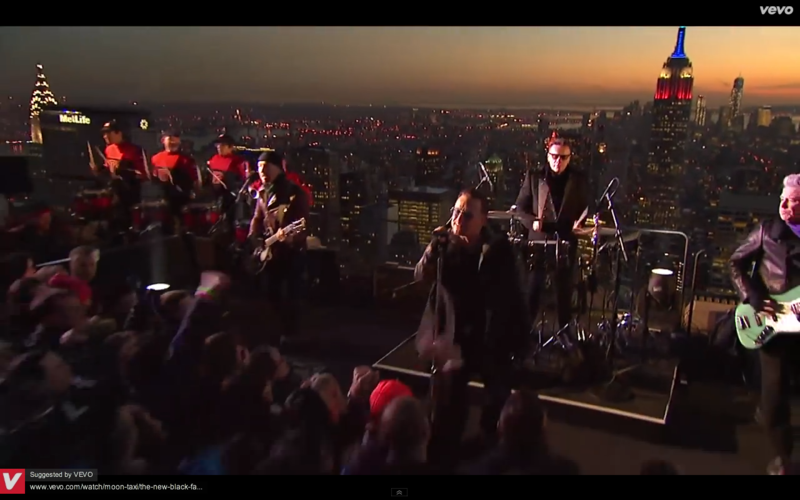 Video screen grab 9 of U2 performing Invisible on The Tonight Show with Jimmy Kimmel from the roof of 30 Rockefeller Center. 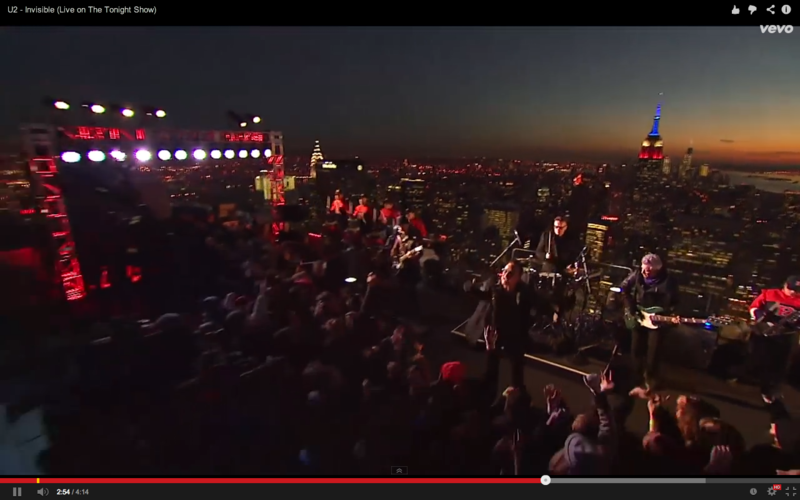 Video screen grab 10 of U2 performing Invisible on The Tonight Show with Jimmy Kimmel from the roof of 30 Rockefeller Center. 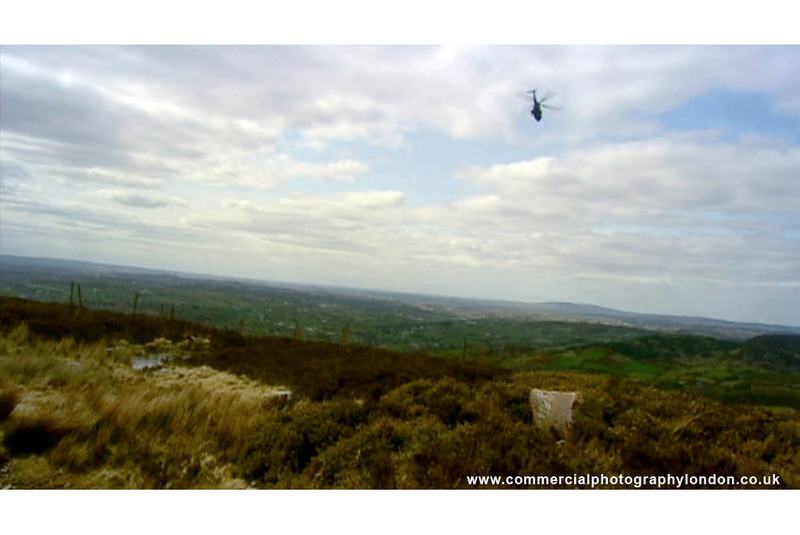 For the final shot, we look up from the ground he was filming as we see photographer Donovan Wylie’s Puma helicopter move into the distance, against a dramatic backdrop of the Irish landscape and skies. Leaving us to connect with the landscape that, until now, we had only seen from afar. The video productions edit now takes away from location filming and to a talking head interview scenario, where Magnum photographer Donovan Wylie talks more about the reasons why he works as he does, how it affects him, those who work with him and those who view his work. Video Production London portfolio video 2 – video still 15. 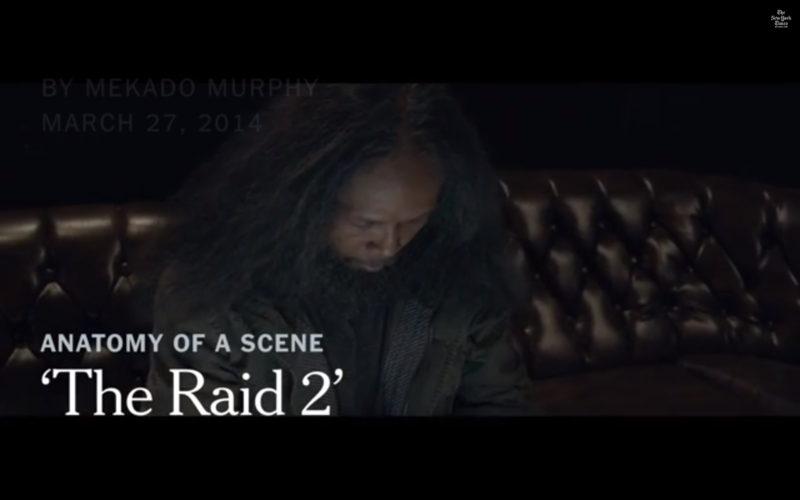 Video production services in London. 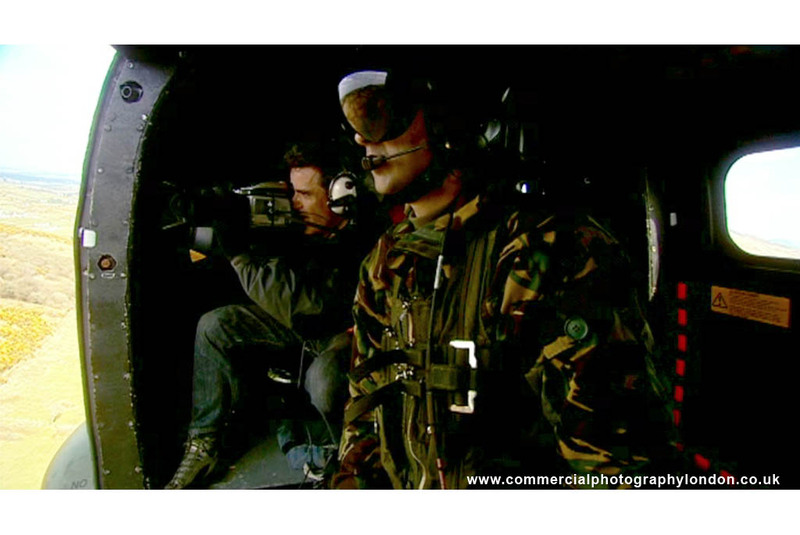 Going now to a wide shot, we see the space within and outside the Puma helicopter, as Magnum photographer Donovan Wylie goes about his work, accompanied by all the helicopter’s crew. While it is a large vehicle from the outside, we can see by the closeness of the window on the other side of the aircraft that the helicopter is quite narrow. This view footage also allows us to compare the amount of safety equipment used by the helicopter crew member, compared with the limited amount used by Donovan Wylie (to allow him free access to manoeuvre his camera equipment to get the best shots). Video Production London portfolio video 2 – video still 14. Video production services in London. 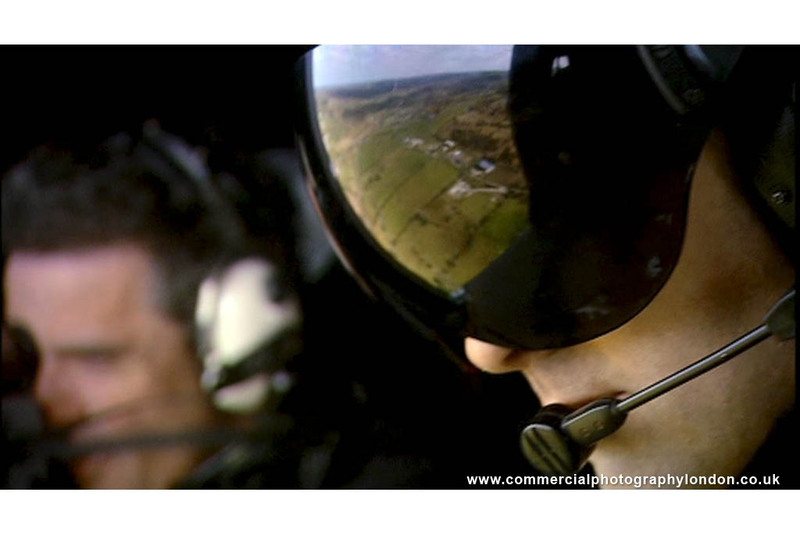 On a tight shot now, we see that Donovan Wylie is not alone, but accompanied by a member of the helicopter’s crew, whose visor creatively reflects that outside of the Puma helicopter in which they are travelling. We now realise that Wylie, the pilot and this crew member are all communicating via the helicopter’s electronic communications system (while not shown as a still image, we also filmed the pilot and navigator at work within the helicopters cabin area to give a better sense of all activity within the aircraft). Video Production London portfolio video 2 – video still 13. Video production services in London.